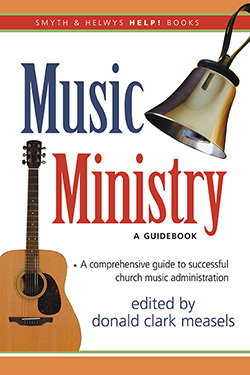 This work is an introduction to church music administration that provides insight into the responsibilities and demands placed on the person who heads the music program of a church. The chapters are written by various experts in their fields and address the topics of weekly worship planning, choir rehearsal preparation, recruitment, church staff relationships, financial management, working with children and youth choirs, and leading orchestras and handbell choirs. This addition to the Smyth & Helwys Help! series is a must-have for those just beginning a church music ministry or for seasoned professionals looking to improve the administration of their music programs. Donald Clark Measels is the Dean of the Division of Fine Arts at Carson-Newman College in Jefferson City, Tennessee. He also chairs the Louis and Mary Charlotte Ball Institute for Church Music and has performed widely in the southern United States as a vocal soloist. He has served in numerous church music positions throughout his career. Who Is the Minister of Music? What Do Pastors Expect from Music Ministers?